A late start to the day, coffee and porridge and then off to Lodge Park, a National Trust property less than ten miles from our home. Restored in 1995, it was both a surprise and a joy. Built as a grandstand to watch Deer Coursing in the 17th century it is real Cotswold gem. This beautiful room, now fully restored, opens on to a large balcony where Crump Dutton’s guests would gamble on events below. The magnificent fire place is a replica and was added only a few years ago. The views from the balcony are lovely and from the roof even better. We had lunch out and then went to visit our chums, David and Jan Cohen who have run Burford Needlecraft for ever and are retiring on Easter Saturday. We wish them a long and busy retirement! It is thought that Burford Needlecraft will continue but who knows…………fingers crossed! Some wonderful stitched samples from Sweden! I am so grateful to Anette for sending me these images and for allowing us to show them. She, as you can see, is a very talented stitcher and makes lovely items from her finished pieces. I am going to let the stitching speak for itself! As you can see, Anette is a wonderful stitcher – In the picture above, she has adapted the violets from the needlebook to fit the tape measure. I must admit to feeling very pleased with myself as she has been a staunch fan for years – I do appreciate seeing finished stitching…….. I wanted to show you what the barn looks like when the evening sun is pouring in from the west. This where I hold my classes although I have to arrange the furniture a little differently to accommodate my students. This time last year, we had a disaster area where the piano now stands. Martin, my wonderful carpenter did everything he could to make this exercise bearable but the weather was dreadful and we had no roof! This is what it looks like now! We just love this space and because of the oak used in the construction, it looks quite old and in character. Bill’s pride and joy, the new piano, was bought to replace our old baby grand which had been built in 1922 and did not like living in a drafty old barn. It was bought from Coach House Pianos and I cannot recommend them high enough. The whole process was a joy – the only problem was having a water tight room…. My little courtyard garden took a bit of a beating! As you can see from the picture at the top of this post, it really was worth it in the end. If I am lucky with the weather this weekend, I am going to work in the courtyard and sort my little greenhouse ready to plant begonias and start some flowers of in seed trays. At the moment we have a lovely show of Hellebore (Christmas roses) and I have noticed some little seedlings that need attention. I will try to get some pictures of their faces – just perfect…. We are working with lavender today – Just lovely! These dear little scented kits were the brain child of Sarah, my PA who seems to think of something new every day! Ho Hum! Not always relaxing! 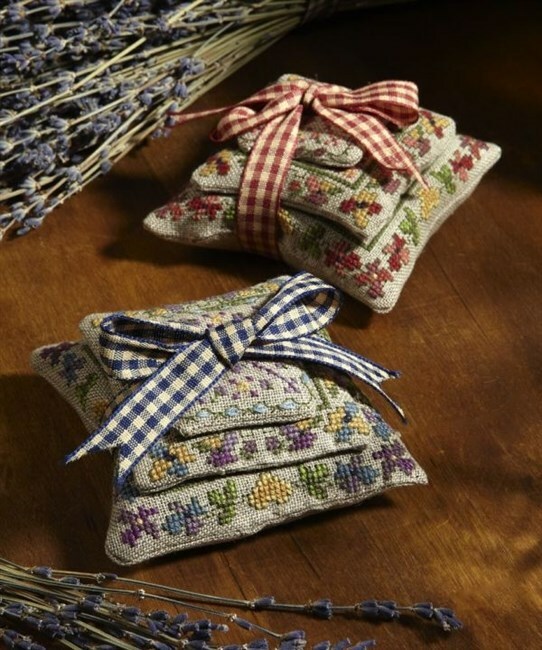 Lavender Tumbles are worked on unbleached linen in pure cross stitch and then stuffed with the lavender flower petals. You can display them as shown in the picture above or split them up and scent drawers or cupboards. Today we have been packing the kits and that includes the lavender petals which is a bit sneezy to start with but nice all the same. You can find Lavender Tumbles in the CSG Shop. This all goes on in the Studio at the back of Pinks Barn. We were so lucky to find this house when we did, little knowing how hard it would have to work. It is one of the best kept secrets in the village as you really cannot get a view of all of it from anywhere and no-one has any idea of what is going on! I thought you would like to see a picture of where we buy our lavender petals used in our Lavender Tumbles – These pictures were taken last year when Bill and I had a day out in Gloucestershire and I was let loose with my camera. Snowshill Lavender is a special place to visit with a pretty gift shop and lovely views over the lavender fields. There are a wide variety of different strains of the plants on show and you can walk amongst the flowers just listening to the bees and the occasional skylark! One of the next projects on the drawing board (well, alright the computer) will be some linen things scented with old rose petals – this I am still cooking! After the Knitting and Stitching Show, I spent a couple of days in a blur, trying to put everything away, send out parcels and prepare for photography tomorrow- Today has been much better – a little designing and a lot of planning. Talking of designing, I thought you would like to add this little motif to your collection – two versions of a lavender motif – very simple but fun! I imagine doing the writing and the flower stems in dark green but please feel free……..